Dione Lineberry * Dallas county Master Gardner, Owner Blue Ribbon Lady Landscaping. Information on plant color, reseeding, rooting. Sallyann Nevins will discuss NGC member service items. Hostesses: Cookie White, Lead Hostess, Dudley Hargove, Johnnie Hargove, Debi Tisdale, Barbara Templeton, Kaycey Bruhn, and Gail Wilson. Donations for Sharing Life Outreach – please bring baking items (flour, sugar, cake mixes, etc.) or any non-perishable food item. Christmas Luncheon Tickets – Buy your tickets for the luncheon scheduled on Tuesday, December 11, 2012. Categories: Meetings | Tags: SGC meetings | Permalink. “FUN Word – Bromelaid – What is it? Bromeliads are perennial monocotyledons — plants that have one seed leaf like lilies or corn, rather than two seed leaves like roses or beans. Their seeds have a food reserve, which means bromeliads can be grown like most other plants.The pineapple was the first bromeliad to make an impression in Europe. *Contact Rachel Doyle at 972.226.4729 if you need a ride. Dinner will be served prior to the program. Program: What is a Bromeliad and how do I take care if it? Betty Patterson, *DFW Bromeliad Society, American Bromeliad Society, Co-author of two books, Bromeliads of Ecuador and Information on acquiring and growing. 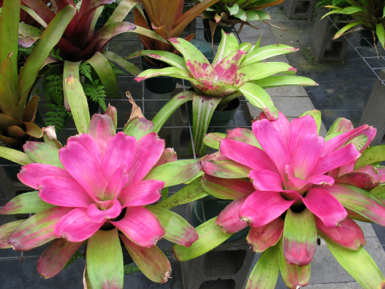 Learn about the different kinds of bromeliads and how to grow them. Mary Ann Moreland, *Dallas County Master Gardener, Nationally Accredited Master Flow Show Judge, Master Texas Design Consultant, Designing with Bromeliads. Hostesses: Mary Ann Moreland-Lead Hostess, Nancy Bassi, Joyce Taylor, D’Ann Robinson, Vicki Slaton, Beverly Williams, Gayle Owen, Doris Padgett. State Fair Tickets/Car Pass Giveaway – Barbara Dybala will give 2 tickets and car passes to the fair. Donations for Sharing Life Outreach – please bring a can of food for our collection. Come join us as we kick-off a new year of garden club meetings and events. Enjoy reconnecting with old friends and meeting new ones. Yearbooks will be distributed. Presentation showing pictures of various forms, color, patterns, and sizes along with information on acquiring and growing. The design portion will be an informative creation of floral design using lilies. Rummage Sale – Nov. 2nd & 3rd – start collecting items for the the fundraiser.